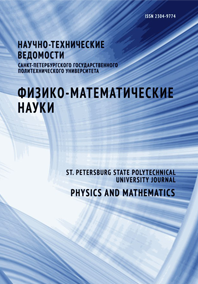 Valuyeva Svetlana V. Borovikova Lyudmila N.
Nanostructures, formed as a result of ionic selenium reduction in selenit-ascorbate redox-system in aqueous solutions of cellulose oxyethyl (OEC), are studied by means of a set of optical methods (flow birefringence, static and dynamic light scattering). The dependence of the moфhological characteristics on selenium : polymer mass ratio in the solution is analyzed. The effect of adsorption of large amount of macromolecules (up to 3200) on the selenium nanoparticles surface is established experimentally. This leads to the formation of super-high molecular nanostructures. The shape of these nanostructures is close to spherical. They possess high density of polymer coating. Thermodynamical condition of the solutions is described.